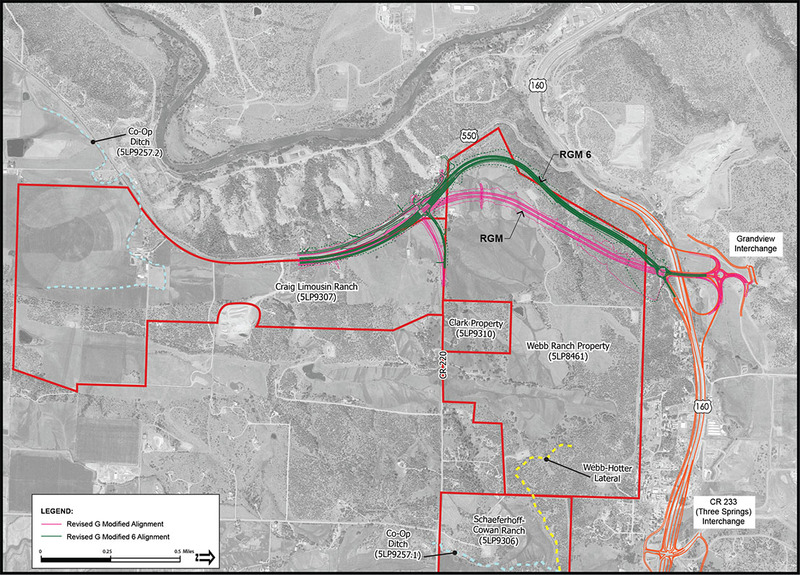 The Colorado Department of Transportation has a new design proposal for connecting US Highway 550 to the Bridge to Nowhere on US Highway 160, also known as the Grandview Interchange. In the new design, referred to by CDOT as RGM6 , the Preferred Alternative, the road would run along the edge of Florida Mesa before popping out at the Bridge to Nowhere (my words), instead of cutting straight across the Webb Ranch. The old Farmington Hill approach would be reclaimed and the existing intersection at the bottom of the hill would be converted to a wildlife crossing. CDOT’s Region 5 Communications Manager Nancy Shanks said that in order to make the grade of US 160 level with that of the existing bridge at the interchange, about 1.82 million cubic yards of material would need to be excavated for RGM6, the Preferred Alternative. With this preliminary calculation of mineral soil/fill that would need to be relocated, CDOT is uncertain as to where this material would be relocated. Where the material is relocated will depend on what other projects are ongoing at the time of the bid, said Shanks. Unless CDOT stipulates something specific at the time of bid, Shanks says that the contractor will likely sell the material to try to offset some costs. In the process of moving the 1.82 million cubic yards of material to meet the grade of the bridge at the interchange, a maximum earthwork cut of 55 feet would need to be taken from Florida Mesa, according to Shanks. Most of the cuts along RGM6 are less than 15 feet, she said. 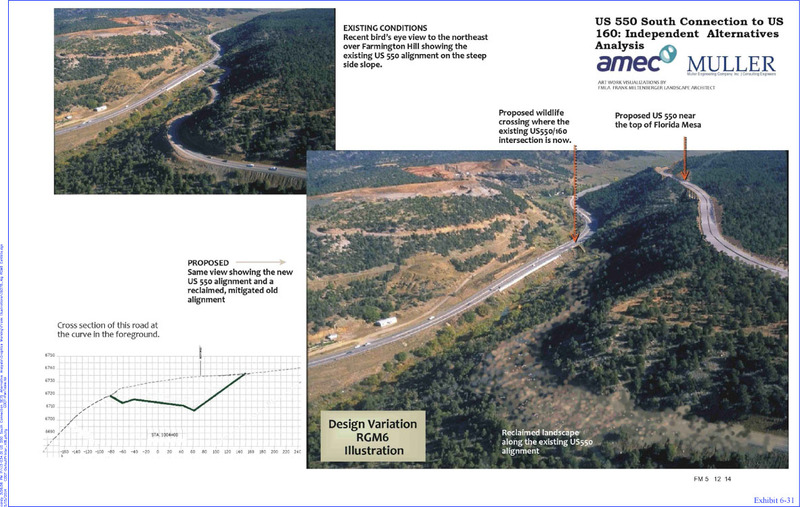 Dan Gregory, an attorney for the Webb Ranch, said that the maximum cut for the previous Preferred Alternative alignment coming out at the Bridge to Nowhere, RGM, was going to be 120 feet deep and 880 feet wide. The discrepancy in the depth of the road cuts predicted by CDOT versus that of Gregory is one this blogger cannot explain without a surveyor to consult. Gregory spoke in favor of using the existing alignment during CDOT’s public meeting on November 2, 2011. CDOT is planning to make a final decision on where to align US Highway 550 with US Highway 160 this winter, said Shanks. Please submit any additional comments/questions no later than Feb 18 (title your email “US 160/550 Connection” and send to nancy.shanks@state.co.us). 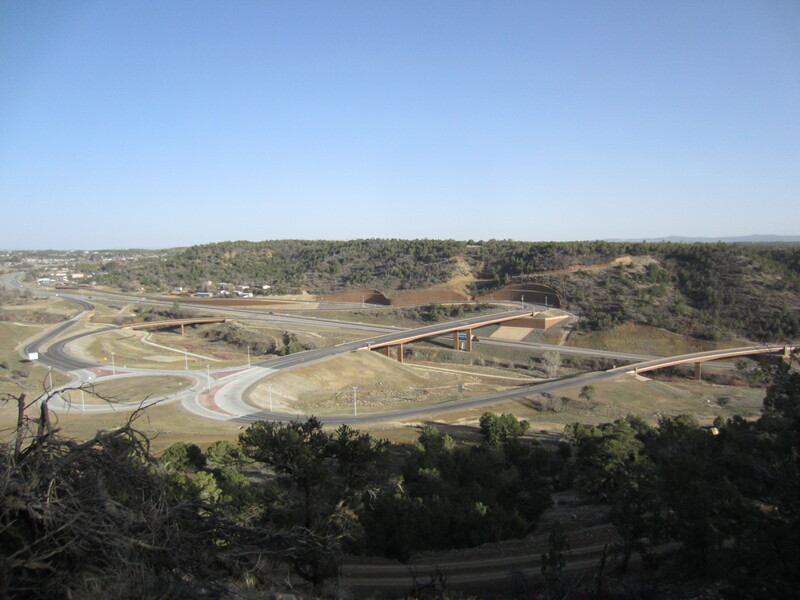 Looking at Florida Mesa and the Grandview Interchange, where CDOT estimates that 1.82 million cubic yards of material would need to be removed in order to connect US 550 at the grade of the Bridge to Nowhere. I went back to the original ROD from 2006 to read, specifically, the “purpose and need’ section. I’m curious if the claim about an increasing number of accidents has been substantiated in the last nine years. I have to admit that I’m a newbie in town, but this seems too much like the most unnecessary of boondoggles. Shoot, rumble strips and a few more cops would make that section safer at greatly reduced expense. I have to say, Adam, that the entire project is wasteful, ill conceived, and will only serve to detract from the beauty of the landscape. Rumble strips versus half a mile of construction zone and the remnants of the old 550 section… It seems like a no-brainer. 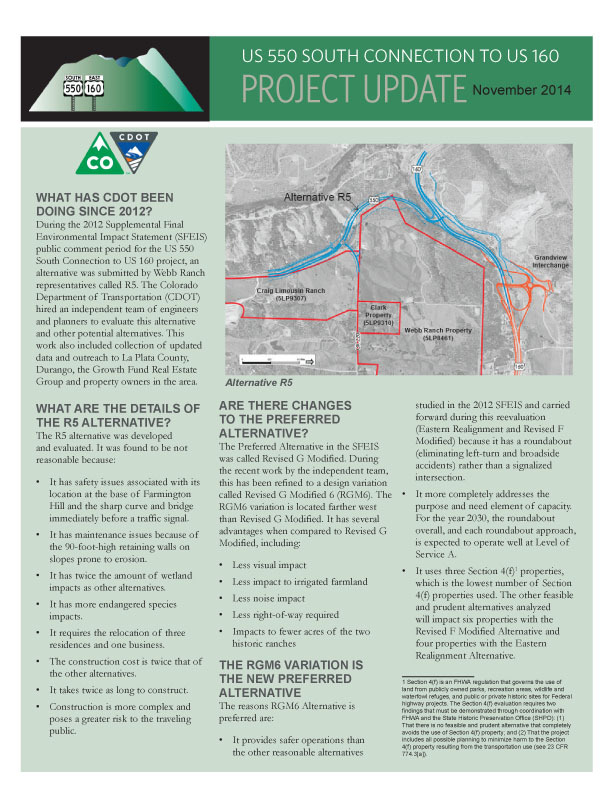 Hey Guy, I am also skeptical about the impact that the excavation of 1.82 million cubic yards of material would have on this piece of land where CDOT wants to connect US 550 at the Bridge to Nowhere. Also, after driving Farmington Hill almost every day of the week, two to three times a day, since last November, I have yet to see any accidents there. I am no traffic engineer, but I think that Farmington Hill could be widened with excavation done into the hillside of Webb’s property. This could help straighten and widen the road enough to create shoulders where people can pullover instead of going immediately into a boulder, guardrail, or worse, off of the western edge, which is basically a cliff. After driving this road a bunch throughout the winter, I also think that it gets decent solar exposure throughout the afternoon. This helps melt snow off of the road. Your idea of rumble strips is creative for getting people to slow down–especially in places where people have repeatedly crashed before or on the bottom part of the hill as people heading northbound are approaching the light. From my personal experiences, I have also not witnessed enough traffic congestion on Farmington Hill to justify the time and expense of fossil fuels needed to move 1.82 million cubic yards of material needed for the construction of a road connecting at the Bridge to Nowhere.